The development of intervention strategies for carriers of mutations in the BRCA1 and BRCA2 genes has several considerations. The first are primary prevention and secondary prevention in unaffected carriers using medical/surgical or lifestyle strategies to prevent cancer development, or screening methods to detect cancers at an earlier stage. The options available are determined by the magnitude and age at onset, risk profile of cancer in carriers (the penetrance function of the gene) and the different cancer sites involved. The management of affected individuals who are BRCA1 and BRCA2 mutation carriers may be altered by their carrier status, because the tumour histology, efficacy of treatment and risk of subsequent cancer development is determined by the BRCA1 and BRCA2 germline status. Carriers of BRCA1 and BRCA2 mutations are relatively rare, so the strategies for management should be determined by international multicentre studies. About 5-10% of breast and ovarian cancers occur as a result of highly penetrant germline mutations in cancer predisposing genes [1,2]. Half of these are due to mutations in BRCA1 or BRCA2 . BRCA1 on chromosome 17q encodes a protein of 1863 amino acids [4*] and BRCA2 on 13q is about twice the size of BRCA1 [5*]. Although deleterious mutations in both genes predispose to earlier onset and an increased risk for female breast cancer, the risk of cancers at other sites and the risk profile differs for the two genes. Collaborative studies by the Breast Cancer Linkage Consortium (BCLC) have combined data from numerous families with germline mutations in BRCA1 and BRCA2 worldwide to determine penetrance estimates and risks for other cancers in BRCA1 and BRCA2 mutation carriers. These have shown that both genes confer an increased risk for female breast cancer of 80-85% by the age of 80 years [6,7**], although the penetrance curve for BRCA1 starts to rise slightly earlier than that for BRCA2 (Figs 1 and 2). 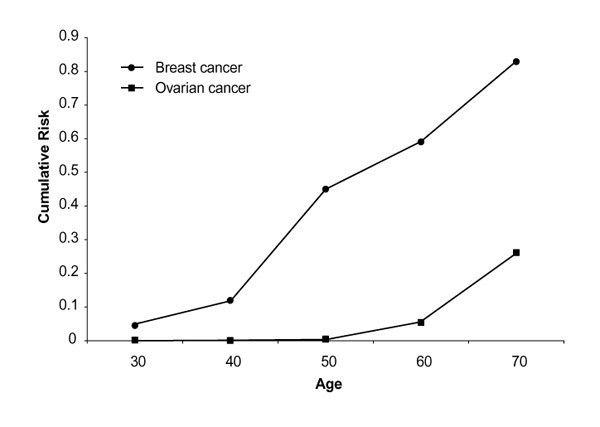 Both genes confer an increased risk for ovarian cancer, but the lifetime risks are higher for BRCA1 (60% by age 80 years) than for BRCA2 (27% by age 80 years; the population risk is just under 1%), and the penetrance curve also starts to rise earlier (late 30s) for BRCA1 than for BRCA2 (mid 40s; Figs 1 and 2) [7**]. It is now clear that both genes confer an increased risk for prostate cancer, which is threefold for BRCA1 mutations [8*] and threefold to sevenfold for BRCA2 mutations [9,10], equating to an absolute risk of 6-14% by age 74 years; the population risk by this age is 2%. Mutations in BRCA1 are also thought to increase the risk of colon cancer to about 6% by age 70 years [8*], but carriers of mutations in BRCA2 do not appear to be predisposed to colon cancer. A recent analysis of the risk of other cancers in BRCA2 carriers  reported a significantly increased risk for cancer of the prostate, stomach, pancreas, male breast, head and neck, ocular melanoma, cutaneous melanoma and fallopian tube, and cancer of the gallbladder and bile duct. Because many of these latter cancers are rare in the general population, the absolute risk is still low in BRCA2 carriers, and targeted screening at these sites, with the exception of prostate cancer, is not warranted. The ethnic origin of the BRCA1 or BRCA2 carrier is important in refining these penetrance estimates. Studies in Ashkenazi Jews and the Icelandic population have reported lower lifetime penetrance estimates for breast cancer of 50-60% in the Ashkenazim  and 37% in the Icelandic population . The risks of ovarian cancer are also lower in the Ashkenazim  than in the overall BCLC estimates. Some researchers have reported a genotype-phenotype correlation of mutation position and breast/ovarian cancer risk , with mutations at the 5' end of BRCA1 and the central part of BRCA2 conferring a higher risk for ovarian cancer. What is unclear is whether this represents a higher risk for ovarian cancer per se or a relatively lower risk for breast cancer, and further studies within the BCLC dataset are ongoing. Table 1 summarizes the risks for cancers in BRCA1 and BRCA2 mutation carriers . *By age 74 years. Data from . *The chance of detecting a mutation is lower, because at least 15% of mutations are regulatory (ie they are not in the coding region of the gene that is the area tested), and the genetic screening methods are approximately 80% sensitive if sequencing is not used. Cases refer to first-degree relatives or first/second-degree relatives if multiple cases. Data from [7**,16,19,21,23,25,72]. Over 200 distinct mutations in BRCA1 and BRCA2 have been described, and are listed in a database on the Inter-net [15,16,17]. These mutations are widely scattered across both genes. Most mutations truncate the protein product, but a significant proportion (34% of BRCA1 and 38% of BRCA2 mutations ) are missense mutations that alter one amino acid, but do not truncate the protein and are of uncertain significance (so-called variants of uncertain significance). At present, the cancer risks from such variants are uncertain and most cancer geneticists would not offer predictive genetic testing for such variants. It is likely that some, but not all will transpire to be rare polymorphisms (normal variants). Because many different mutations have been described in different families (apart from founder mutations in certain populations such as the Ashkenazim and Icelanders[18,19,20,21,22*,23]), when an individual wishes to know their BRCA1 and BRCA2 carrier status, the mutation present in the familial cancer cluster is first determined by mutation screening of blood DNA from an affected family member (diagnostic testing) and a predictive genetic test is then offered to the unaffected family member who is seeking testing when the mutation is identified. The predictive test only ascertains whether the unaffected relative has that specific mutation. It is recommended that predictive genetic testing is preceded by full counselling of at least two sessions, interspersed with a minimum 1-month 'cooling off' period, similar to the genetic testing protocol for Huntington's disease . At present, the optimal method of counselling for both affected and unaffected members of the family is unknown; affected members who give a blood sample to determine the mutation often receive less counselling than the unaffected individual. One may postulate that they may need more support, because they have a cancer diagnosis that they then learn has a genetic basis and this may have been passed on to future generations. The counselling requirements of affected persons need to be studied. The chance of a mutation being present in BRCA1 or BRCA2 in certain clusters is shown in Table 2. There are currently several approaches to the management of men and women who are carriers of BRCA1 and BRCA2 mutations. The options available depend on whether the individual is already affected or is unaffected with cancer. Broadly, for an unaffected carrier, these options are as follows: early detection through screening programmes; changes in lifestyle; chemoprevention; and prophylactic surgery. The value of mammographic screening for female carriers ofBRCA1 and BRCA2 mutations is currently under evaluation.Population mammographic screening is offered in the UK to those aged from 50 to65 years every 3 years, because this has been shown to reduce mortality by atleast 20% (for summary ). However, BRCA1and BRCA2 carriers are at risk for early-onset breast cancer, and justover half of this risk occurs at ages before the start of the screeningprogramme. Guidelines for individuals who have a family history of breastcancer (not specifically BRCA1 and BRCA2 mutation carriers)have just been compiled by the UK Cancer Family Study Group . Lalloo et al  haveshown that mammographic screening of a population aged under 50 years with afamily history (the genetic status was not determined) detects as many cancersper 1000 women screened as the UK National Breast Screening Programme. Thecancers detected were not all indolent preinvasive tumours. However, no studyhas yet proven that targeted screening of younger women with a family historyof breast cancer improves survival. It is common practice to offer annual mammography from ages 35-50years in BRCA1 and BRCA2 carriers, but the screening intervalafter 50 years is undefined. The penetrance curves for breast cancer riskcontinue to rise until ages 75-80 years, and so many clinics offer annualmammography until the mid-70s. The screening interval in women with a familyhistory only (not BRCA1 and BRCA2 carriers) is extended to 18months after age 50 years. This is because, in the general population, invasiveinterval cancers are more frequent among women aged 40-49 years than in olderwomen, but this is not due to a difference in the S-phase fraction in tumoursin older women . If there is a very young individual (<30 years) with breastcancer in the family, many units will start mammographic screening at 30 years,but there is concern about radiation-induced tumours if mammography isinstigated any younger than this. this is based on extrapolations from atomicbomb radiation exposure data . Furthermore, it isnow thought that BRCA1 and BRCA2 may mend double-strandbreaks, and they colocalize with rad51 [31*]. We havepreliminary data from normal fibroblast clonogenic radiation survival curvesand DNA repair assays that BRCA1 carriers are not more radiosensitiveand are not DNA repair deficient when compared with related noncarriers fromthe same family  (unpublished data), but thosestudies were based on doses equivalent to those used in therapy rather thanscreening, and the numbers are very small (six carriers). There are no humanradiosensitivity data for BRCA2 heterozygous normal cells. The teaching of breast awareness is practiced in many breastclinics that manage BRCA1 and BRCA2 mutation carriers, andstudies in the general population  have shown thatit downstages nodal status in tumours at presentation, but it does not appearto reduce mortality. Alternative methods of breast imaging are being assessed inBRCA1 and BRCA2 mutation carriers and in women of unknownmutation status in high-risk families using magnetic resonance imaging of thebreast with gadolinium contrast enhancement . Breastmagnetic resonance imaging has some potential advantages because it does notuse irradiation and is more sensitive than mammography. There is also concernthat BRCA1-associated breast cancers have a lower proportion of ductalcarcinoma in situ than those in BRCA2 carriers [35*], and therefore they may be less easily detected onmammography. This is more controversial because ovarian screening in high-riskwomen has not yet been shown to reduce mortality, although a population-basedstudy  showed a mortality reduction(P=0.0112). There is an ongoing United Kingdom Coordinating Committeefor Cancer Research trial of ovarian screening with annual transvaginalultrasound and CA125 measurement in women with at least two cases of ovariancancer or breast and ovarian cancer in their family history. BRCA1 andBRCA2 carriers can be entered into this study. Screening is started atage 30 years for BRCA1 and at 35 years for BRCA2 mutationcarriers because of the later start of rise in level of ovarian cancer risk forBRCA2. Targeted prostate cancer screening in first-degree relatives ofbrother pairs with the disease has demonstrated a higher detection rate ofprostate cancer than expected , but whether there isa reduction in mortality is uncertain. A study of prostate-specific antigen anddigital rectal examination screening in male carriers of BRCA1 andBRCA2 is being proposed (Eeles et al, unpublished data). From Table 1, there is also a risk for coloncancer in BRCA1 carriers, but in families with multiple cases of coloncancer colonoscopic screening is only offered if the lifetime risk is greaterthan 10%. Furthermore, there is an increased incidence of right-sided colonictumours in hereditary nonpolyposis colorectal cancer families . In BRCA1 carriers, the lifetime risk is 6%, andit is unknown whether there is a side predilection for these tumours. Ifstudies confirm the increased risk for colon cancer and show it to be leftsided, sigmoidoscopy screening may suffice. This is a question that needs to beanswered. The risk for male breast cancer in BRCA2 carriers is small(5% lifetime), but is still 100-fold that in the general population.Mammography is not feasible and may not be warranted anyway at this level ofrisk, and self-examination is suggested. Male breast cancer in BRCA2carriers is very rare in those aged less than 50 years. Carriers of mutations in the BRCA2 gene are also at riskfor other cancers. The absolute lifetime risks are very low, but one cancerthat can be monitored by the carrier is cutaneous melanoma. There should be alow threshold for examination of any suspicious skin lesions by adermatologist. A number of lifestyle factors have been shown to influence the development of breast cancer in the general population, although most of these have not been specifically investigated in BRCA1 and BRCA2 mutation carriers. The factors that have been shown to affect female breast cancer risk in the general population but that have not been investigated in BRCA1 and BRCA2 carriers are diet, alcohol intake, exercise and hormone replacement therapy. Smoking has been shown to reduce breast cancer in BRCA1 and BRCA2 carriers, probably due to an antioestrogenic effect , but its carcinogenic properties at other sites precludes its use to reduce breast cancer risk. The oral contraceptive pill (OCP) reduces the risk for ovarian cancer in BRCA1 and BRCA2 carriers to the same degree as in the general population, but its effect on breast cancer risk has not yet been reported. Modelling of breast and ovarian cancer mortality without any surgical intervention is difficult to achieve because it is unknown whether the risk of breast cancer in BRCA1 and BRCA2 carriers who take the OCP is the same as that in the general population. If a prophylactic oophorectomy is performed, however, this has been shown [40*,41*] to reduce both breast and ovarian cancer risk, and if use of the OCP raised breast cancer risk it could theoretically be disadvantageous to take the OCP because the reduction in ovarian cancer risk could be provided by the surgical option. Early age at first pregnancy does not seem to offer protection from breast cancer, unlike in sporadic disease . The role of tamoxifen prevention is discussed at length in another review in the present issue . In brief, tamoxifen may reduce the incidence of breast cancer in the white American population by 45% [44**], but two further publications [45**,46**] have failed to show this effect. It is possible that the studies used different populations of women with different familial cancer risks, which may have affected the outcomes of the trials. Theoretically, chemoprevention with tamoxifen may be less effective in BRCA1 carriers, because their tumours are more likely to be oestrogen receptor negative [35*]. Prophylactic mastectomy to reduce breast cancer risk is increasingly being offered to carriers of BRCA1 and BRCA2 mutations. The uptake of this option is lower in the USA  than in the UK  and Holland . Its efficacy is unproven, but retrospective data [50**] have suggested that there is a 90% reduction in mortality. Prophylactic oophorectomy reduces mortality from ovarian cancer [40*], and also from breast cancer in BRCA1 and BRCA2 carriers [41*]. There has been a reported case of a male having prophylactic mastectomy ; he was at a one in two risk in a BRCA2-like family in which no mutation could be found. His lifetime breast cancer risk was, in fact, only 2.5%, which is lower than the general population female breast cancer risk. This highlights the issue that levels of anxiety weigh heavily in the decision-making process to proceed with prophylactic surgery, and may be more influential than the absolute level of risk . Because of the body-image issues surrounding prophylactic mastectomy, it is recommended that individuals who are considering prophylactic mastectomy should be offered a protocol of a cancer genetics risk assessment, a clinical psychological assessment, and consultations with the breast surgeon and clinical nurse specialist in breast care. This should include being shown photographs of good and poor cosmetic results, and the breast surgeon should either have extensive experience in reconstructive surgery or work closely with a plastic surgeon. The type of mastectomy offered will depend on the woman's physique and preference. For prophylaxis, as much as possible of the breast tissue is removed, and either an implant is inserted or a tram flap is used (the muscle of the flap replacing the breast tissue). There is no evidence that silicone implants are associated with an increased cancer risk . Prospective studies of the efficacy of these operations are needed. Prophylactic oophorectomy reduces the risk of ovarian cancer [40*], but cancer can still occur in the peritoneum because these cells have the same embryological origin as those on the surface of the ovary. The chance of this occurring is uncertain, but may be as low as 2-3% . The following issues have to be considered in the management of a BRCA1 and BRCA2 mutation carrier who is affected with cancer: is the tumour pathology any different and does this impact upon management of the tumour? ; is the survival from the cancer any different? ; issues surrounding radiosensitivity or chemosensitivity; screening for second primary cancers; and prophylactic surgery. Breast cancer in BRCA1 mutation carriers tends to be of higher grade and to have a higher proportion of atypical medullary cancer and a lower proportion of carcinoma in situ . BRCA2 has a lower rate of tubule formation, which is a bad prognostic feature [35*]. Mutiple regression of the pathological features of the breast cancers in BRCA1 and BRCA2 mutation carriers shows that the main pathological predictor of BRCA1 is mitotic count, lymphocytic infiltration and continuous pushing margins, but not the medullary phenotype per se. This would predict that the survival from breast cancer in BRCA1 carriers would be worse, but studies of survival from breast cancer in BRCA1 carriers show conflicting results. Thirty-one studies related to survival from breast cancer and familial factors were reported between 1996 and 1999; these were summarized in a review by Chappuis et al [56**]. These were divided into family history studies, linkage studies and mutation-based studies. Of the family history studies (18 studies in total), four showed a better survival in individuals with a family history than in those without, two showed worse survival and the rest showed no difference. In the linkage studies (three studies in total), two families linked to BRCA1 had a better survival and one linked to BRCA2 had a worse survival relative to the general population. Finally, in the mutation-based studies (10 studies in total), eight showed no difference and two showed a worse outcome in mutation carriers relative to those in the general population. No study conclusively proves that survival is improved in BRCA1 carriers. The problem with these studies is that there is inherent bias because most mutation detection has to be performed on DNA from blood, and the woman with breast cancer therefore have to be alive to be tested. This can partly be overcome in two ways; the first is to ignore the proband that was tested in the survival analysis. When this was done in the study by Verhoog et al , the survival changed from no difference to a worse survival in BRCA1 carriers, although this was not statistically significantly different. The second method is to take stored breast cancer tumour material from all patients and test for BRCA1/BRCA2 mutations. This is currently only feasible in a population such as the Jewish population in which the entire gene does not have to be screened for mutations, because they have three common founder mutations in BRCA1/BRCA2; such studies by Foulkes et al  and Lee et al  in Jewish women showed no difference in survival. Only the studies in Jewish women and another study by Verhoog et al  have studied survival in women with breast cancer due to BRCA2 mutations. These suggest that the survival from breast cancer in BRCA2 carriers is the same as in the general population. Such tumours tend to be oestrogen receptor positive; this feature is a good prognostic factor in sporadic patients. If BRCA1-associated breast cancer has a worse prognosis, it may be important to offer radical therapy even to those with very early tumours. For example, this may be a group in which even very small (<1cm) grade 3 tumours should be treated with adjuvant chemotherapy, an area in which at present there is controversy about the role of adjuvant chemotherapy . Robson et al  have shown that women with founder BRCA1/BRCA2 Jewish mutations are at increased risk for ipsilateral breast cancer-related events after breast conservation, although this was not statistically significant. There is a statistically significant increased contralateral breast cancer risk (relative risk 3.50, 95% confidence interval 1.78-8.74; P =0.001). Oncologists are considering the appropriateness of conservative management in view of such results. As yet, the data are not strong enough to prove bilateral mastectomy as the management of choice, but studies of follow up of carriers such as those being conducted by Easton, Goldgar and Narod, within the BCLC, will help to answer this question. There are data that suggest that survival is worse in ovarian cancer that occurs in familial cases with or without an association with BRCA1/BRCA2 mutations [63,64,65,66,67]. It is not yet known whether tumours in BRCA1 or BRCA2 mutation carriers have a different sensitivity to DNA damaging agents. Mice that are brca1 or brca2 null have increased radiosensitivity and chemosensitivity [68,69,70], but human BRCA1 heterozygote fibroblasts do not seem, on preliminary data, to have an increased radiosensitivity . It should, however, be emphasized that the human data are based on very small numbers and are for high dose rate irradiation of fibroblasts only. This does not provide data on BRCA2 or low dose rate irradiation. After cancer development in a BRCA1 or BRCA2 mutation carrier, they are at risk for second primary cancers. The risk for development of a second primary breast cancer after the first breast cancer in women is 64% and 56% lifetime in BRCA1 and BRCA2 mutation carriers, respectively [7**]; the balance of risk of cancer recurrence from the first primary and risk of a second cancer therefore needs to be considered in the management of the individual carrier with cancer. Prophylactic surgery for the risk of certain second cancers can also be used to help with treatment of the first primary cancer; it has been shown that oophorectomy improves survival from breast cancer in large meta-analyses . Such surgery can therefore be used as part of the treatment of the first cancer to improve survival, and reduce risk of a subsequent new cancer. The cancer risk profile of BRCA1 and BRCA2 mutation carriers is becoming clearer, although uncertainties still exist regarding the differences between ethnic groups, the extent of genotype-phenotype interactions, the influence of environment on phenotypic expression and the effect of genotype on outcome after cancer treatment. The relative rarity of BRCA1 and BRCA2 carriers means that the study of these questions will necessarily be in large multicentre, international trials. The discovery of other breast cancer predisposing genes that may be more prevalent and of lower penetrance will result in the development of tailored treatment and prevention strategies for oncology patients according to their cancer-predisposing genetic profile.